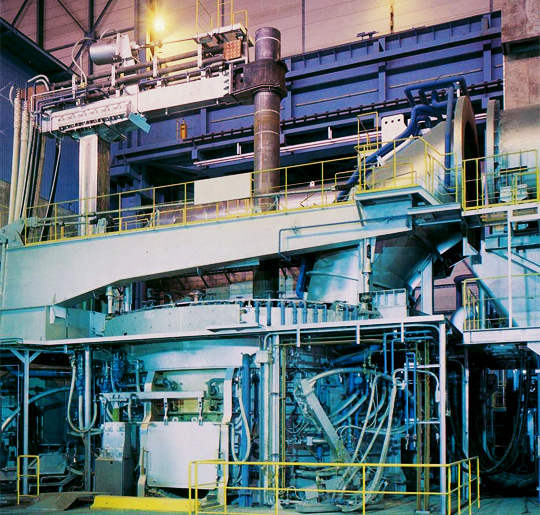 Steel Plantech’s electric furnaces for steelmaking are core products succeeded from JFE Engineering (formerly NKK). Its abundant experience as a steelmaker (or in other words, a user) in addition to technical know-how gleaned from experience in the design and engineering of electric furnaces for steelmaking, accumulated since 1968, enabled the provision not only of electric arc furnaces and auxiliary equipment, but also a wide range of metallurgical and operational technology. 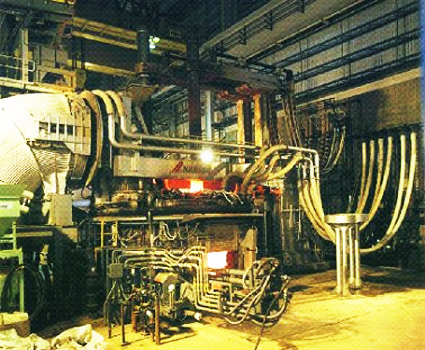 world class electric arc furnace provision. Maintenance costs are dramatically reduced through the provision of sturdy facilities that have a high degree of reliability and a long service life. Steel Plantech can design and provide a wide range of facilities, from standard type electric furnaces and auxiliary equipment that cater to customers’ needs. We also provide fine-tuned services—from the diagnosis of existing equipment and operations to remodeling, updating and after-sales service—according to the facility’s stage in its lifecycle. Steel Plantech is a pioneer in high-efficiency, high-impedance long-arc electric furnaces. 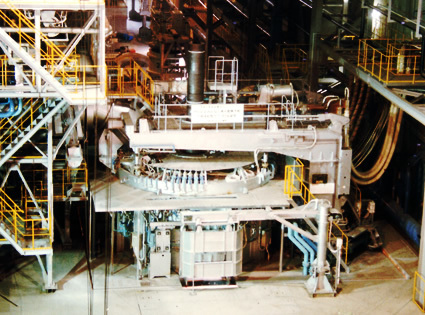 A well-balanced body design, improved water-cooled panels and advancements in slag-foaming technology have realized high-power, high-impedance electric arc furnaces operation. The latest electric arc furnace for ANSDK of Egypt meets a difficult demand: to melt the main raw material—DRI—at a high speed while achieving lower power consumption. With a maximum of 110MVA/t, it is one of the largest electric arc furnaces in the world, which goes far beyond UHP arc furnaces. 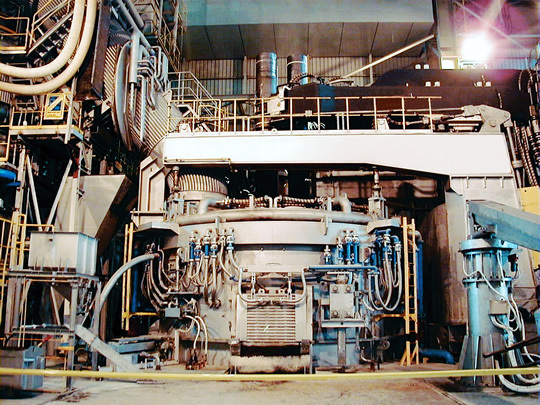 With a single long arc at its center, a DC electric arc furnace can be considered an ultimate long-arc AC electric arc furnace with no electrode PCD. The turn coil system at the bottom of Steel Plantech’s DC electric arc furnace provides perfect arc deflection control as well as powerful molten steel stirring. Furthermore, they are equipped with a long-life, maintenance-free bottom electrode (2,000-4,000 charges). Steel Plantech delivered the largest DC electric arc furnace in the world. Conventional secondary refining furnaces (ladle furnaces) are based on AC electric arc furnace technology. They have three independent masts with electrode arms and the lifting was individually controlled. 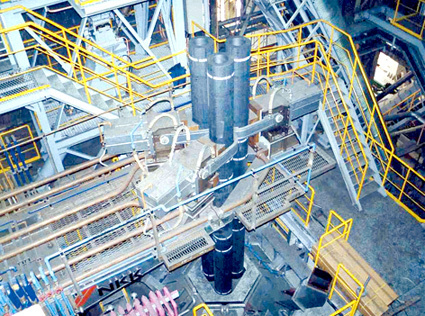 Steel Plantech takes advantage of flat bath operation, a characteristic of secondary refining furnaces, and developed a secondary refining furnace that controls three electrodes simultaneously, naming it the Single-Mast Furnace (SMF). SMFs have a simple mechanical configuration and enable high-power-factor short-arc operation. 4Easy operation by the simple single electrode lifting system. Electric arc furnaces, which use direct-reduced iron, etc., as the main raw ingredient, need to be able to melt the raw materials, which are continuously supplied during flat bath operation, at high speeds. 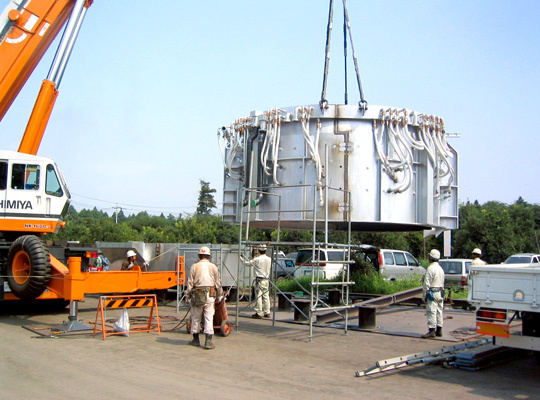 The dual electrode DC electric arc furnace uses the turn coil　at the bottom of the furnace to intentionally deflect the arc from two electrodes towards the center. This creates an optimal “hot spot” at the center of the furnace, resulting in a high melting speed.